Bacterial microcompartments are protein shells found in bacteria that surround enzymes and other chemicals required for certain biological reactions. For example, the carboxysome is a type of microcompartment that enables bacteria to convert the products of photosynthesis into sugars (thus taking carbon out of the atmosphere). During the formation of a microcompartment, the outer protein shell assembles around hundreds of enzymes and chemicals required for the reaction. Because the intermediates in this assembly process are small and short-lived, it is hard to study in detail using experiments. 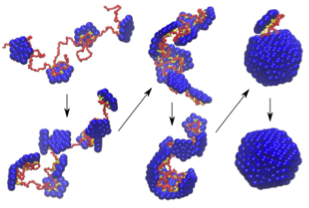 It is therefore useful to develop computational models that can help explain how proteins collect the necessary cargo, and then assemble into an ordered shell with the cargo on the inside. The videos in this post show some examples of computer simulations of a model for bacterial microcompartment assembly, with each video corresponding to a different set of parameters that control the strengths of interactions among the proteins and cargo. The study is described in the research article “Many-molecule encapsulation by an icosahedral shell” by Jason Perlmutter, Farzaneh Mohajerani, and Michael Hagan in eLife (eLife 2016;10.7554/eLife.14078). Lipids hit a “sweet spot” to direct cellular membrane remodeling. Lipid membrane reshaping is critical to many common cellular processes, including cargo trafficking, cell motility, and organelle biogenesis. The Rodal lab studies how dynamic membrane remodeling is achieved by the active interplay between lipids and proteins. Recent results, published in Cell Reports, demonstrate that for the membrane remodeling protein Nervous Wreck (Nwk), intramolecular autoregulation and membrane charge work together in surprising ways to restrict remodeling to a limited range of lipid compositions. F-BAR (Fes/Cip4 homology Bin/Amphiphysin/Rvs) domain family proteins are important mediators of membrane remodeling events. The F-BAR domain forms a crescent-shaped α-helical dimer that interacts with and deforms negatively charged membrane phospholipids by assembling into higher-order scaffolds. In this paper, Kelley et al. have shown that the neuronal F-BAR protein Nwk is autoregulated by its C-terminal SH3 domains, which interact directly with the F-BAR domain to inhibit membrane binding. Until now, the dogma in the field has been that increasing concentrations of negatively charged lipids would increase Nwk membrane binding, and thus would induce membrane deformation. Surprisingly, Kelley et al. found that autoregulation does not mediate this kind of simple “on-off” switch for membrane remodeling. Instead, increasing the concentration of negatively charged lipids increases membrane binding, but inhibits F-BAR membrane deforming activities (see below). Using a combination of in vitro assays and single particle electron microscopy, they found that the Nwk F-BAR domain efficiently assembles into higher-order structures and deforms membranes only within “sweet spot” of negative membrane charge, and that autoregulation elevates this range. The implication of this work is that autoregulation could either reduce membrane binding or promote higher-order assembly, depending on local cellular membrane composition. This study suggests a significant role for the regulation of membrane composition in remodeling. Brandeis authors on the study included Molecular and Cell Biology graduate students Charlotte Kelley and Shiyu Wang, staff member Tania Eskin, and undergraduate Emily Messelaar ’13 from the Rodal lab; postdoctoral fellow Kangkang Song, Associate Professor of Biology Daniela Nicastro (currently at UT Southwestern), and Associate Professor of Physics Michael Hagan. Kelley CF, Messelaar EM, Eskin TL, Wang S, Song K, Vishnia K, Becalska AN, Shupliakov O, Hagan MF, Danino D, Sokolova OS, Nicastro D, Rodal AA. Membrane Charge Directs the Outcome of F-BAR Domain Lipid Binding and Autoregulation. Cell reports. 2015;13(11):2597-609. Dr. Aparna Baskaran of the Physics Department has been awarded the prestigious CAREER grant from the National Science Foundation that is a highly competitive development grant for early career tenure track faculty members. This grant will fund the research ongoing in Dr. Baskaran’s group on dynamics in active materials. Active materials are a novel class of complex fluids that are driven out of equilibrium at the level of individual entities. 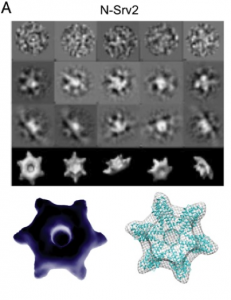 Examples of such systems include bacterial suspensions, cytoskeletal filaments interacting with motor proteins and inanimate systems such as self-propelled phoretic colloidal particles. The theoretical challenge in understanding these systems lies in the fact that, unlike traditional materials, we no longer have the scaffold of equilibrium on which to base the theoretical framework. At the practical front, these materials exhibit novel properties not seen in regular materials. Further, they form the physical framework of biological systems in that regulatory mechanisms modulate the mechanical properties of this material in response to environmental stimuli. Dr. Baskaran’s research in this field will be done in collaboration with the groups of Dr. Michael Hagan, Dr. Zvonimir Dogic and Dr. Bulbul Chakraborty. It will enhance and complement the MRSEC research activities in the active materials thrust. Figure Caption : Videos of example systems for active materials. A) A fish school exhibiting complex collective swimming. B) Swarming at the edge of an E. Coli Bacterial Colony. C) Cytoplasmic streaming inside the yolk of a fertilized cell. 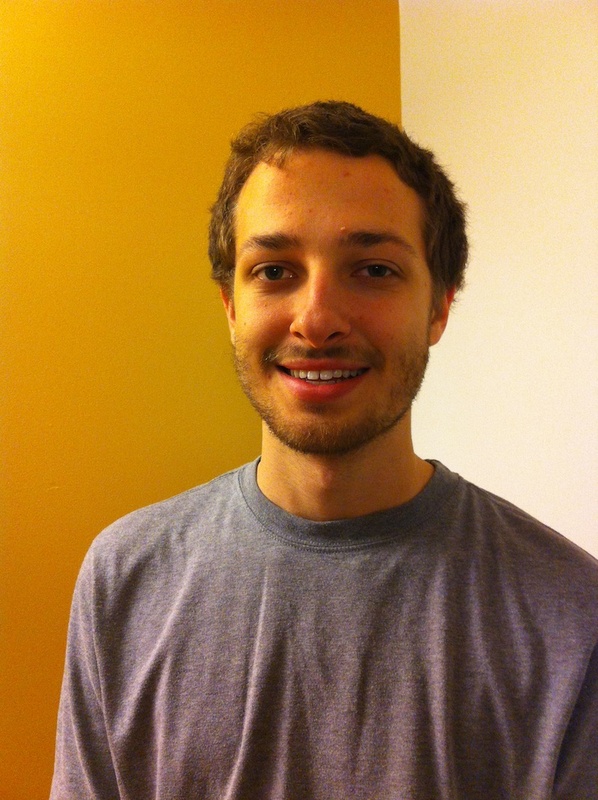 Samuel McCandlish ’12 (Physics) , a current student who did research with Michael Hagan and Aparna Baskaran, resulting in a paper “Spontaneous segregation of self-propelled particles with different motilities” in Soft Matter (as a junior). He then switched to work with Albion Lawrence for his senior thesis research. Sam will speak about “Bending and Breaking Time Contours: a World Line Approach to Quantum Field Theory” at the Berko Symposium on May 14. Sam has been offered a couple of other fellowships as well, so he’ll have a nice choice to make. Sam will be heading to Stanford in the fall to continue his studies in theoretical physics. Briana Abrahms ’08 (Physics). After graduating from Brandeis, Briana followed her interests in ecological and conversation issues, and in Africa as a research assistant with the Botswana Predator Conservation Trust, Briana previously described some of her experiences here in “Three Leopards and a Shower“. Briana plans to pursue as Ph.D. in Ecology at UC Davis. Sarah Robinson ’07 (Chemistry). Sarah did undergraduate research with Irving Epstein on “Pattern formation in a coupled layer reaction-diffusion system”. After graduating, Sarah spent time with the Peace Corps in Tanzania, returning to study Neurosciene at UCSF. Si Hui Pan ’10 (Physics) participated in a summer REU program at Harvard, and continued doing her honors thesis in collaboration with the labs at Harvard. Her award is to study condensed matter physics at MIT. Elizabeth Setren ’10 was a Mathematics and Economics double major who worked together with Donald Shepard (Heller School) on the cost of hunger in the US. She has worked as an Assistant Economist at the Federal Reserve Bank of New York and her award is to study Economics at Harvard. Michael Ari Cohen ’01 (Psychology) worked as a technology specialist for several years before returning to academia as PhD student in the Energy and Resources Group at UC Berkeley.